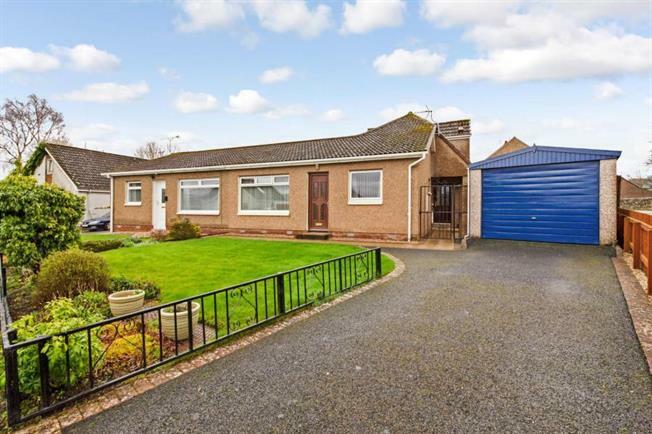 3 Bedroom Semi Detached House For Sale in Stirling for Offers Over £175,000. Sitting within a preferred corner plot amongst stunning and well maintained gardens, this is a fabulous opportunity to acquire a three bedroom semi detached family home located in the popular residential locale of Carseview in Bannockburn. The property which offers flexible accommodation over two levels and comprises of welcoming reception hallway, bright front facing lounge, two double bedrooms, an luxury three piece family bathroom and a lovely modern fitted family sized kitchen complete with a range of base and wall mounted units. This charming family area provides ample dining space to the rear, as well access up-stairs to the third bedroom and a three piece shower room. To the outside the property has driveway with a detached garage with up and over door, timber shed. The stunning grounds to the front and side are mainly to lawn with well stocked and planted flower beds. To the rear the property has beautifully landscaped garden grounds complete with patio area and lawn and offers a high degree of privacy. The property has double glazing and gas central heating. The property is located in a popular address within the Bannockburn area. Bannockburn provides excellent amenities with local shops along the Main Street which will adequately cater for every day needs and requirements. Schooling is available in the area at primary and secondary level. The business traveller is well provided for by the national road network system that links motorways and from here to business centres in the Central belt.